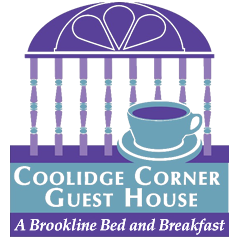 The Coolidge Corner Guest House, a Brookline bed and breakfast, is in a quiet residential neighborhood a 6-minute walk from the nearest Green Line public transit station for access to central Boston. We’re a 10 minute drive from downtown Boston Mass and close to local colleges, universities, and hospitals. 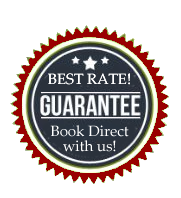 Be sure to book direct with us for the best rates on the Internet! Our family-owned Victorian B&B guesthouse is an affordable and comfortable alternative to luxury inns, hotels, and chain motels. The friendly and knowledgeable staff will help you find the best of Brookline and Boston dining, sight-seeing, transportation and make the most of your stay at The Coolidge Corner Guest House. The guest rooms at this Boston area inn blend antique chic style with modern amenities: flat-screen TVs, free WiFi, cable channels, and central air conditioning. Some guest rooms share bathrooms. Common areas at our Brookline bed and breakfast inn include a private garden, sitting room, and dining room. Guests can also use a kitchenette and laundry facilities. Our expanded Continental breakfast is complimentary and features Boston’s best bagels from Kupel’s Bakery. Throughout its history, Brookline has resisted being annexed by Boston, in particular during the Boston–Brookline annexation debate of 1873. The neighboring towns of West Roxbury and Hyde Park connected Brookline to the rest of Norfolk County until they were annexed by Boston in 1874 and 1912, respectively, putting them in Suffolk County. Brookline is now separated from the remainder of Norfolk County. Coolidge Corner, which is located at the crossing of Beacon Street and Harvard Street, is one of Brookline's two primary retail districts (the other being Brookline Village). It includes a number of historically significant sites, including the S.S. Pierce Building, and the Coolidge Corner Theatre. Larz Anderson Park is in Brookline on the 64-acre (26 ha) estate once owned by Larz Anderson and Isabel Weld Perkins. The park contains the Larz Anderson Auto Museum, the oldest automobile collection in the country, as well as Putterham School, a one-room schoolhouse from colonial times.